Note: This is an unapproved draft and should not be referenced or quoted under any circumstances. Give develops concrete things that they can start with for accessibility - "quick tips"
Note that this does not meet the purpose of providing very specific tips for developers. The first column below shows Perceivable on the front; Operable, Understandable, Robust on the back. The second column shows Perceivable and Robust on the front; Operable and Understandable on the back. Show that "How to Meet: A customizeable quick reference... "
Keep it clear that WCAG20 is the standard. See 1 August 2008 minutes for discussion of purpose. Proposed main goal: What document do I go to for what information? Images & animations: Use the alt attribute to describe the function of each visual. Image maps. Use the client-side map and text for hotspots. Frames. Use the noframes element and meaningful titles. Tables. Make line-by-line reading sensible. Summarize. Web developers use authoring tools and evaluation tools to create Web content. People use Web browsers, media players, assistive technologies, or other "user agents" to interact with content. ATAG for authoring tools, content management systems, blogs, etc. Provide text alternatives for non-text content (images, controls, etc). Provide high contrast and resizable text. Use color but not as the ONLY way things are marked. Provide speech without sounds behind it (always or as option). Give users enough time to read and use content or option for more time. Do not use content that flashes more than 3 times per second. Provide headings, labels, skip links etc that help user move around on page. Be consistent, use conventions, and don't have unexpected behaviors. Help avoid user errors, ask for confirmation, and provide guidance to recover. Use standards correctly so things will work with assistive technologies. Would like to do WCAG 2.0 at a Glance cards right away. Would take longer to do HTML Techniques content. Probably won't do a components one in the near future, partly due to dissatisfaction with the current image. e-mail thread starting 6 June from Shawn " For review: WCAG 2.0 at a Glance card"
e-mail thread starting 3 June from Shawn "Updated: WCAG 2.0 at a Glance card [was: A Quick Tips Idea for WCAG 2.0]"
e-mail thread starting 3 June from Shawn "EOWG: Components & WAI guidelines cards"
e-mail thread starting 24 May from Wayne "A Quick Tips Idea for WCAG 2.0"
Note: Don't add ideas on bullets where not addressed in WCAG 2.0. Make information adaptable and available to assistive technologies. Give users enough time to use content. Do not use content known to cause seizures. 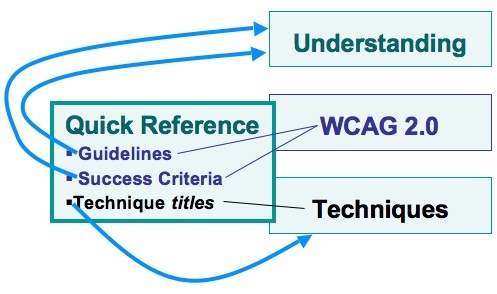 The goal is to provide a short, easy-to-understand overview/summary/distillation of WCAG 2.0, in order to increase the comfort level that WCAG 2.0 is "approachable". This is geared for a broad audience: those who already know accessibility and WCAG as well as those who don't; developers, managers, policy makers, etc. It is not trying to be specific tips like the old Quick Tips cards. We plan to provide a print version of this information. We might decide to print it on business card-sized cards (like the old Quick Tips cards), and thus would be very limited on word count and design. To keep it one one line in some material, we may need to abbreviate "Make information adaptable and available to assistive technologies." to: "Make info adaptable & available to assistive technologies." Commented out: One line has changed since the previous version: "Do not use content known to cause seizures." was previously "Do not cause seizures." Provide text alternatives for images and any non-text content. Ensure that all information can be determined by assistive technologies. Use contrast to make things easy to see and hear. Allow users to ask for more time to use content. Design content so that it does not cause seizures. Design to help users find and navigate content. Design content to help users avoid and correct mistakes. Maximize compatibility with current and future browsers, media players, and assistive technologies. Provide captions and descriptions or full text alternatives for [any time-based media | multimedia]. Ensure that all information can be determined by assistive technologies so that it can be re-presented. Use contrast (visual and auditory) and text size to make things easy to see and hear. Allow users to adjust or ask for more time to read and use content. Design content to help users find and navigate content. Remember the goal is for those not familiar with accessibility to read this and think, "ok, I understand the basic idea"; it does not need to be technically accurate. WCAG says: "Compatible: Maximize compatibility with current and future user agents, including assistive technologies." The Succses Criteria are: "Parsing: 4.1.1 In content implemented using markup languages, elements have complete start and end tags, elements are nested according to their specifications, elements do not contain duplicate attributes, and any IDs are unique..." and "Name, Role, Value: 4.1.2 For all user interface components (including but not limited to: form elements, links and components generated by scripts), the name and role can be programmatically determined; states, properties, and values that can be set by the user can be programmatically set; and notification of changes to these items is available to user agents, including assistive technologies." Maximize compatibility with browsers and assistive tech. Maximize compatibility with browsers and other tools. Maximize compatibility with browsers and user tools. Maximize compatibility by using good markup and coding. Maximize compatibility with future browsers and accessibility tools. Maximize compatibility with browsers and other user agents. Maximize compatibility by meeting coding requirements. Maximize compatibility by coding and marking up well. Maximize compatibility through good markup and coding. Maximize compatibility with good markup and coding. Make content compatible with users' technologies. Make content compatible with different user technologies. Maximize compatibility with users' technologies. Maximize compatibility with different user technologies. Code content so it is compatible with users' technologies. Code content so it is compatible with user technologies. Be compatible with browsers and assistive technologies. WCAG: "Adaptable: Create content that can be presented in different ways (for example simpler layout) without losing information or structure." Previous at a Glance: "Make content adaptable; and make it available to assistive technologies." How People with Disabilities Use the Web: "Content can be presented in different ways"
NOTE: these are just brainstorms, not suggestions! NOTE: would like to keep under 55 characters if possible. Create content that can be presented in different ways (including with assistive technologies) without losing meaning. Make content that can be presented in different ways (including with assistive technologies) without losing meaning. 1.3 adaptable: Allow different presentations of content (i.e, simpler) without losing information or structure. Make content adaptable to different types and styles of presentation. Assistive technology can change perceptual mode or style with no loss of meaning. Content supports style and mode changes that enable perception and preserve meaning. Meaning and structure come through with any technology. Content works, regardless of assistive technology used. Content works with all interfaces and devices. Content reconfigures for all interfaces and devices. Content is reconfigurable for assistive technology. Editor: Shawn Lawton Henry. Developed by participants of the Education and Outreach Working Group (EOWG). Copyright © 1994-2011 W3C® (MIT, ERCIM, Keio), All Rights Reserved. W3C liability, trademark, document use and software licensing rules apply. Your interactions with this site are in accordance with our public and Member privacy statements.